Time for some more blood-thirsty, first-love silliness! You have to love the voice of the narrator who is telling the “story” of our eternally 20-year-old vampiresses. Sakurako goes towards Hayato with a small smile on her face as if she is being pulled in by him. Koma quickly grabs her friend and urges her to leave. But they just go there? Koma says she has a bad feeling and manages to pull Sakurako away from Hayato’s stage (the young man looks a little confused). Upstairs, Sakurako is happily strumming her newfound guitar and spinning around the room, still smiling. Koma comments on Sakurako’s mood and Sakurako immediately stops playing, smile gone. Koma warns her friend that Sakurako is being too defenseless—what if that boy is a trap? Well…they could always get him later if things turned bad, but still. Sakurako then reminds Koma that they, too, used to be human by nature. Koma then spouts out rule 24: Humans are Humans and Vampires are Vampires. Sakurako replies that she knows this. Koma then says it was obviously a bad idea to come to the human world. Sakurako laughs and agrees. What should they do now then? Koma suggests going around town to sightsee and the girls start giggling as they remember when they first stepped foot in the new human realm. For being around 200 years old, these girls are rather like children than adults. Morning comes and Aoi closes up shop. Sakurako covers the windows up to keep out the sunlight from the apartment and then goes to join Koma behind a makeshift dressing room. They have taken some of Ken’s clothing and are trying to take off their clothes to change into his. Ken wakes up and they apologize for waking him. He then asks if they understand their situation. Koma and Sakurako then wonder if he’s a foreigner since his hair his brown. 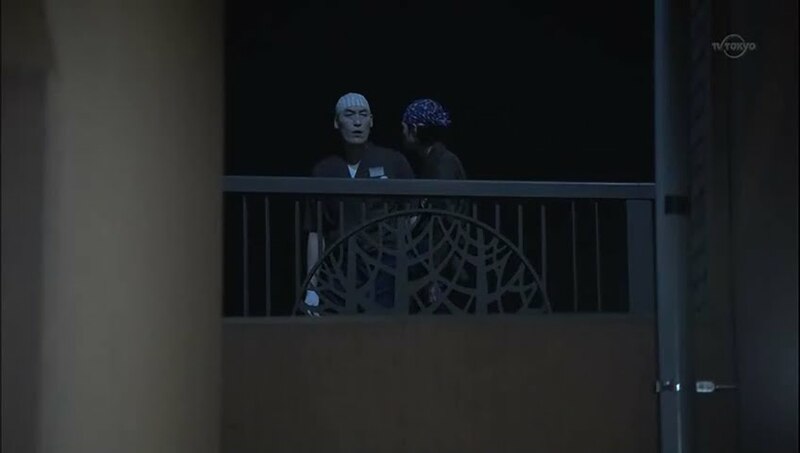 Ken assures them he’s Japanese and tries to talk, but they talk over him from his skin tone to just plain ignoring him. Sakurako then apologizes and tells Ken they are changing and shuts the curtain in his face. Ken immediately pokes his head back in with a smile. Koma pats his head and asks if he wishes to see. Ken replies that he is a man after all. Koma then pushes his head out and he apologizes. The two girls keep Ken from trying to peak an then change into his clothes. They are very ill fitting, but the girls don’t care, they seem to like the look and are absolute fascinated with the zipper on one of Ken’s sweaters. 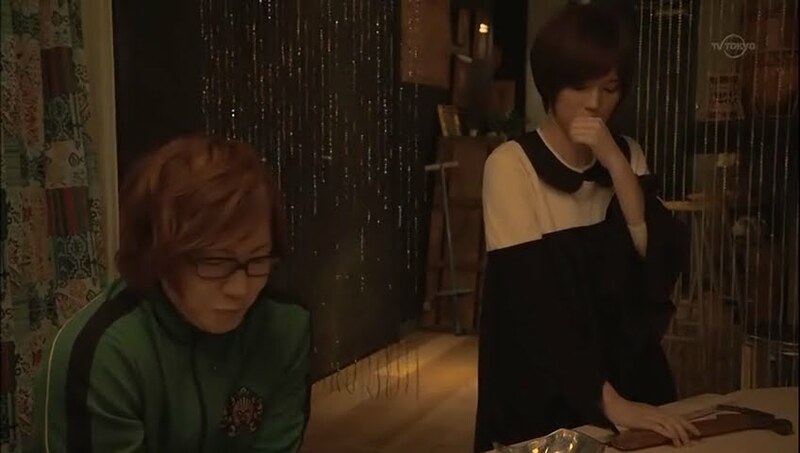 They go into the Midnight Café where Aoi takes a look at what they are wearing and wonders if Ken was the one who coordinated the outfits. Ken quickly denies and responsibility—the girls picked them out themselves. Aoi then says they can help themselves to whatever is in Ken’s room since the boy is nice. 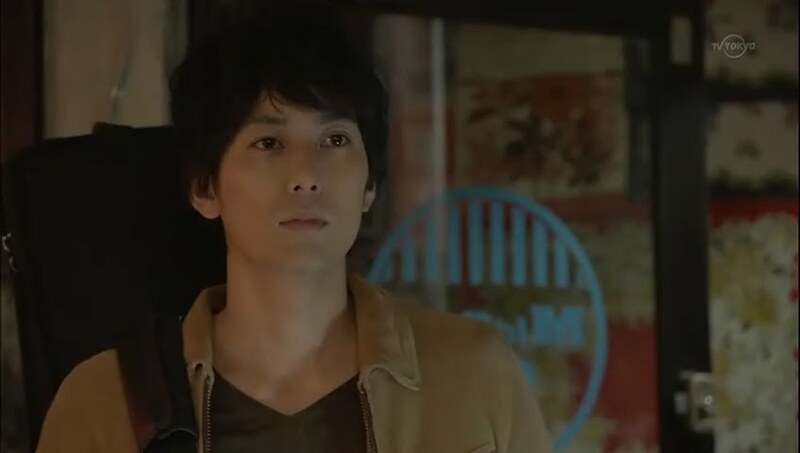 Ken gets upset, but Aoi doesn’t listen to his protests as a person must help others in trouble. Sakurako then thanks Ken while Koma apologizes. 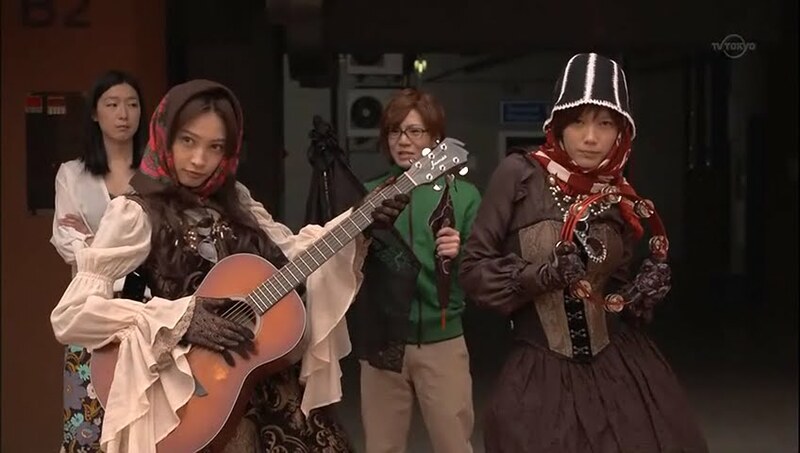 I had to laugh as the two girls were also playing with the strings of Koma’s hoodie and Sakurako nearly strangled Koma. LOL. It is cute because some of the parts where they are reacting to things the first time do seem genuine and not quite so fake and very cute. Three girls then enter. It’s Risa and her friends. They recognize Koma and Sakurako from the other night when they saw the beautiful dresses. 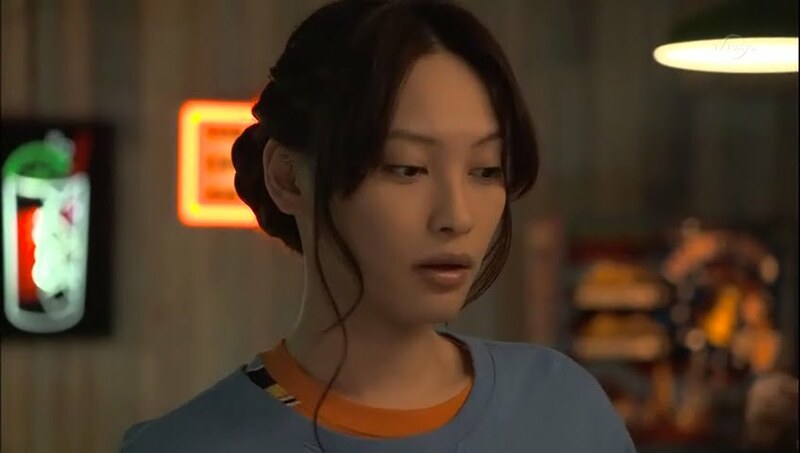 They ask what happened to the dresses and Sakurako goes to talk about how they stood out too much from other humans when Koma grabs her hand and tells her to go. The girls pick up on Koma calling her Sakurako. Sakurako in turn introduces them to Koma-chan who gets annoyed when one of the short-haired girls wonders if it is short for Komatsu. No. It’s for Komachi. Risa and her friends then talk about the cute and unusual name. Sakurako says the name is rather old when they are asked if they are sisters. Sakurako is quick to refute this. They are not sisters, but have lived together for a long while now—100 years, right? Oi. Sakurako is HORRIBLE at keeping the secret! Luckily the trio just think she’s being funny/clever. One girl then asks if Komachi’s name is from Ono no Komachi to which Komachi quickly replies it is. Risa then starts reciting the waka poem and Komachi happily joins in. The trio says its very nostalgic and reminds them of high school. Koma looks taken aback. Enter Hayato. Risa and her friends immediately flock to Hayato, ignoring the other two girls. 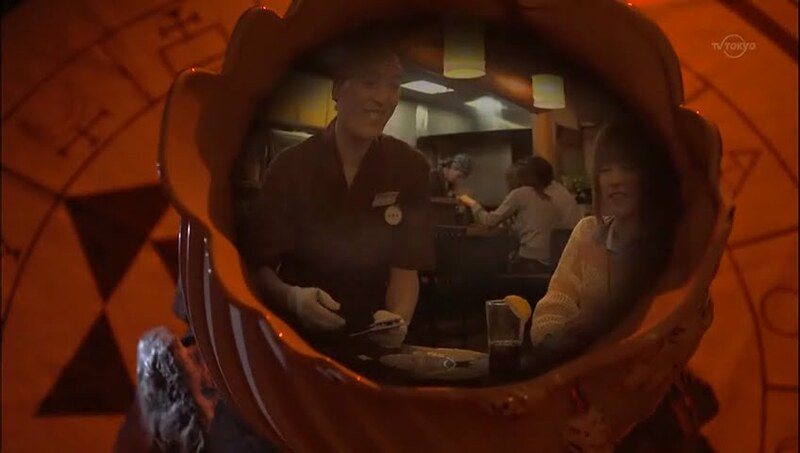 Of course, Sakurako starts staring all happily googoo eyed once more making Koma very unhappy. 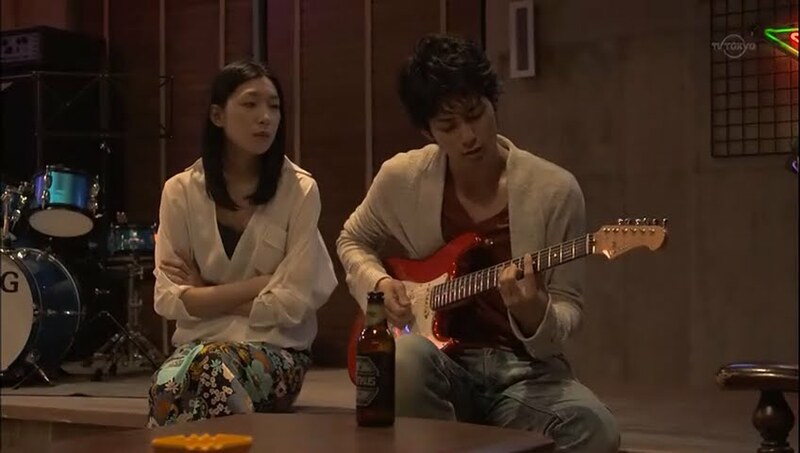 Hayato tells Risa he thinks he can compose a new song and Risa mentions a connection of her papa’s from a record label in charge of a battle of the bands. 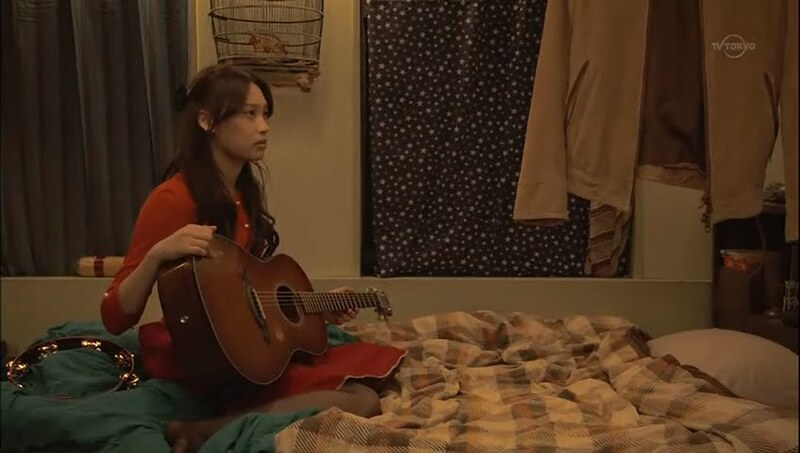 Hayato seems hesitant to accept Risa’s offer, but she insists she wishes for more people to hear his songs. 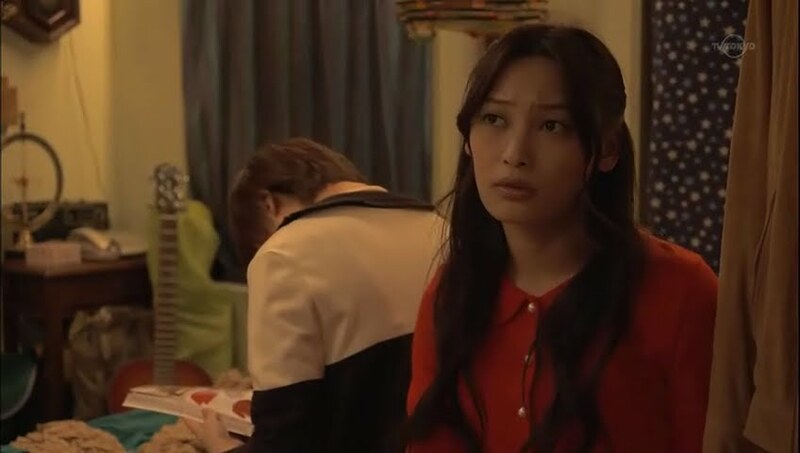 Risa won’t listen to Hayato’s protests and drags him towards the door. She nearly knocks into Sakurako who quickly backs up and nearly steps on Ken-chan’s banana peels. She avoids these, but falls against the bar and ends up on the floor with a pail of water dumped on her head. Wow. What a klutz. Koma looks worried, Risa looks annoyed, her friends look embarrassed and Hayato has his usual expressionless mask on. 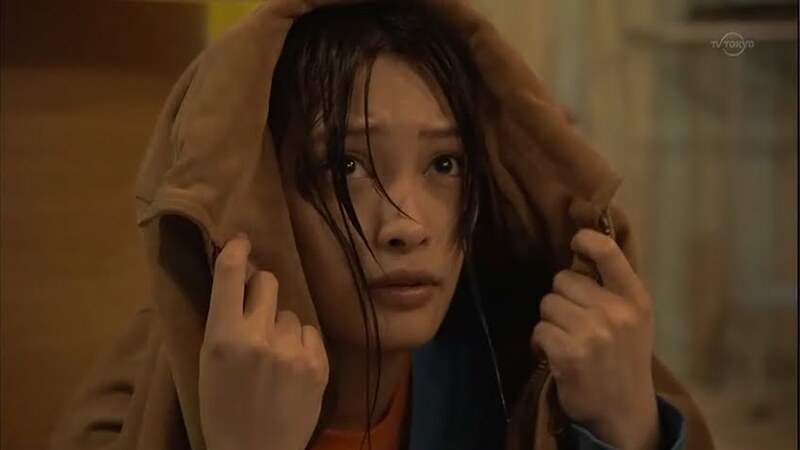 Aoi apologizes for leaving the bucket sit at the end of the bar and Ken rushes off to get something to help Sakurako while Hayato throws his coat over her head. Sakurako looks up and he tells her that if she doesn’t dry those unattractive clothes, she’ll catch a cold. Awww. He’s nice in such a not nice way. Koma is immediately angered by his attitude. She grabs him and he says it’s Sakurako’s own fault for falling. The angry Koma then grabs a fork and holds it to Hayato’s neck. He makes her angry. Sakurako quickly grabs the fork away from Koma and Risa and her friends quickly leave with Hayato. Upstairs, Koma dries off Sakurako’s wet hair as the other girl clutches Hayato’s jacket. Koma vows that Hayato will be the first one she takes care of. Sakurako holds up the jacket and says since Hayato lent her that, then he’s a good guy, right? Nope. Koma then talks about ripping open the artery in his neck and heart. Ignoring this, Sakurako points out the wet clothing. Should they get some new ones? Koma asks if Sakurako only wants new clothes because of Hayato’s comment. Sakurako denies this. It’s bad if they keep borrowing Ken’s clothes all the time is wrong. Koma likes wearing Ken’s clothes, but Sakurako thinks dressing like Risa and her friends wouldn’t be a bad thing. Koma things about it. Well…they have been wearing nothing but black for over 100 years, right? They go to Aoi who tells them they need money to buy clothes. do they have any? 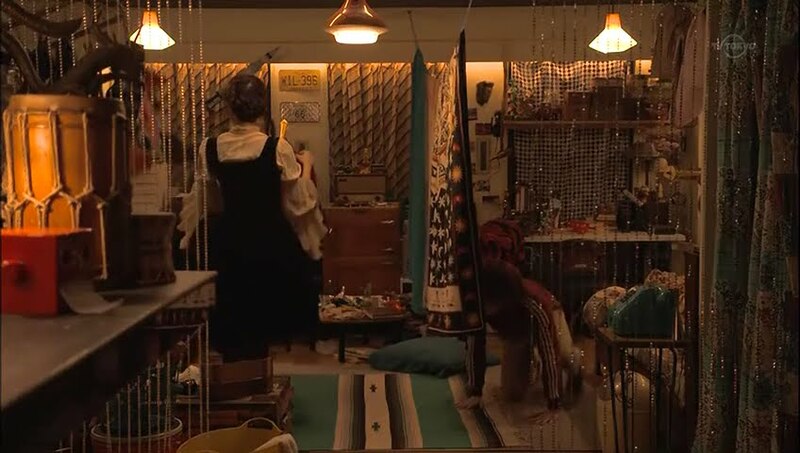 The girls pull out all of their trinkets. Aoi looks at the pile of nonsense and says they can’t buy anything with that stuff. She promises to lend them the money which they must pay off by working at the club. The girls aren’t happy with this arrangement. The girls put on their clothes from the vampire realm along with scarves, and sunglasses. They look very suspicious. They also have parasols, the guitar and a tambourine. Wow. They are now ready to head out to go shopping. As long as they are not in direct sunlight, they should be fine. They walk out into the bright sunlight and when nothing happens, happily skip along followed by Ken. The Count asks if Sakurako has been found yet. His minion apologizes and goes to leave, but the Count stops him. Why do his other minions work part-time in the human world? Because in the human world you cannot live without money. Unfortunately that is much to true. Sigh. Anywho, thus his minions are working various part-time jobs to collect money, drink as little blood as possible, and find out information on the missing Sakurako. This minion promises to find Sakurako and return her to Count in no more than 10 years. This shocks the Count. How many years does he plan on taking to search for her? The minion apologizes. He took eternity as the criterion. LOL. The count holds out his hand and turns the minion to dust. Ken takes the girls to Harujuki where they have lots of fun. The girl group who sing the theme song even have an appearance handing out fliers for their CD and live. They then find a shop that suits their tastes and try on clothes and learn about things like pockets. The girls are excited to be wearing clothes with colors and patterns, although they feel the shortness of some things to be a bit scandalous, though Koma likes the freedom of movement in the outfits. I can’t believe no one notices that there was no reflection of them in the mirror at all. Night has fallen and the girls and Ken return to the apartment just missing the minions who have to quickly return to work or else their boss will get mad. LOL. The young one is such a hothead, not happy with having to back to their part-time job. Meanwhile, the girls have changed and Ken assures them the new look suits them. Sakurako then asks if Koma will return the jacket. Koma refuses as they will soon have to go to work. Koma looks at a magazine while Sakurako fingers the coat sleeve. Koma looks up and notices Sakurako’s expression. What’s wrong. Sakurako rubs her chest. It’s somewhat painful there. This freaks Koma out—she’s never heard of their kind getting sick. Is it a stabbing pain? A throbbing pain? Sakurako describes it as “kyun” an expression used to refer to love. Sakurako wonders if it’s because of the sun. This conversation is soon stopped when Ken turns on the TV. The girls immediately flock to the television. How did the little people get there. Ken wonders what provincial part of the world they come from that they don’t know about television. He tries to explain the mechanics of it (he talks about Hertz, signals, and all that jazz) but the girls aren’t really listening. They try talking to the TV, but soon quiet down so they can listen to what the tiny people are saying. It just so happens it’s a drama where a girl is wondering if she loves a guy. Perfect timing for the girls. 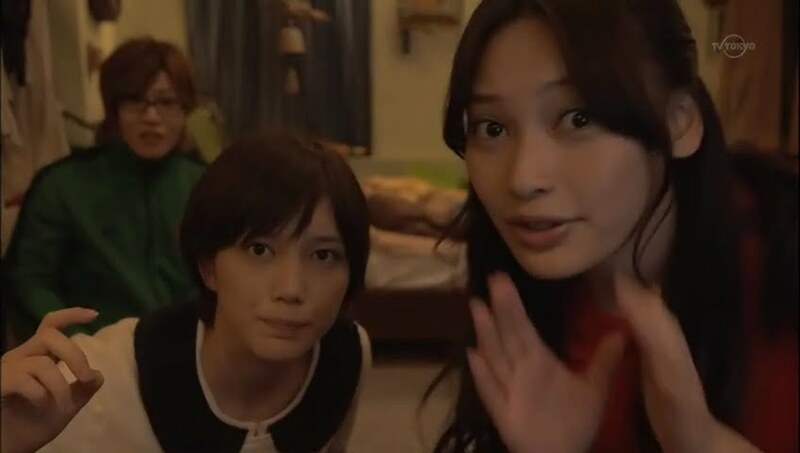 Ken-chan turns off the TV making the two girls upset. Where did the little people go? What will happen next? They are dying to know! Ken then turns the TV back on and the girls watch it, enthralled. Downstairs Hayato is strumming his guitar as Aoi watches him. Did he buy a new guitar? 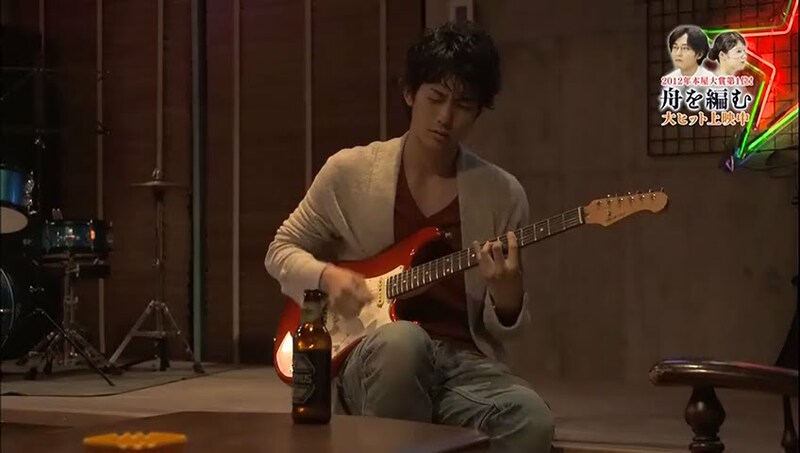 Well… Aoi sits down next to him and asks if he thinks changing the guitar will solve his problem. Hayato ignores this questions and angrily strums harder. Aoi puts her hand on his shoulder and says that she’s looking forward to it. Upstairs, Sakurako is playing the guitar while Koma is nailing together coffins. Koma asks “that green thing” to help. Ken comes over unhappy that she is calling him in such a way. He then asks why she’s making a bed with a cover. Because she doesn’t do well in the light. Ken then asks how long they intend on staying. Koma doesn’t answer this and asks for him to get her more nails. Ken goes to do her bidding and Sakurako takes the tambourine and coat and goes out to give it back to Hayato. Once Sakurako leaves, Koma nails her thumb instead of the nail. Upping her annoyance is Ken’s question about Sakurako possibly liking Hayato. Koma then says that Sakurako has a fiancé in her hometown. This surprises Ken. Koma goes to say something else, but stops herself. I’m thinking that fiancé is the Count. Ken then asks if Koma is hungry. Koma says she is and Ken goes into the kitchen to cook while Koma’s fangs come out and she heads to the kitchen with a smile. 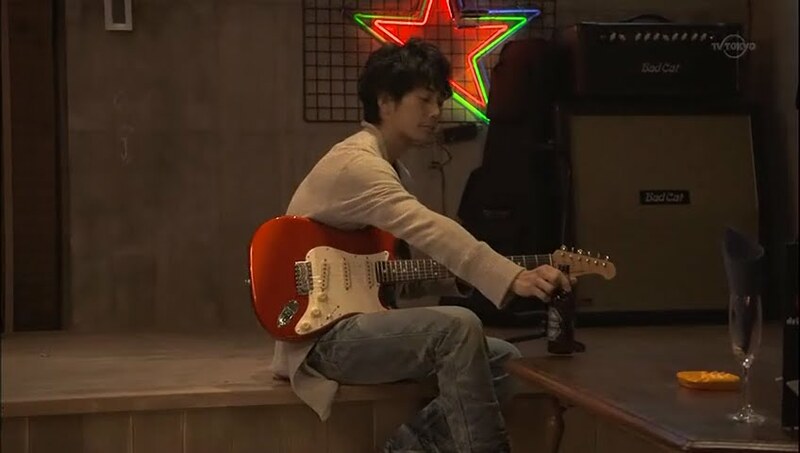 Sakurako find Hayato sitting on the stage drinking a beer. She thanks him for his help the other day. Hayato waves this off saying it was nothing. He also tells her she didn’t immediately need to return the coat. Sakurako hands it over and accidentally touches Hayato who notices how cold her hands are. Sakurako drops the tambourine and bends down to pick it up when she is immediately attacked by a wave of hunger. She gets up and her mouth is at Hayato’s neck. Will she bite him? I must say I’m really trying to figure out why Hayato pulled Sakurako so close to him when he felt how cold she was. It didn’t make sense as he wasn’t putting his jacket on her or anything, but whatever. It makes for dramatic affect when she gets up and is so close to the jugular. Our narrator then says how this is a love story involving life and death since vampires can only survive by drinking human blood. Oi. The next episodes scenes look like a lot of fun as our two vampiresses get drunk! Will they be able to keep their secret for very long?